Sue, Jake, Simon, Pastor & Marie, all excellent to work with. Weather was chilly and cloudy, however we came up with plan B which worked our amazingly well. Simon captured the moments and took some amazing photos for us to treasure. 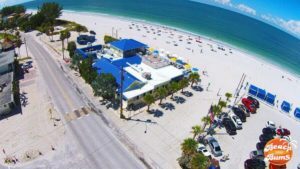 Thank you Suncoast! 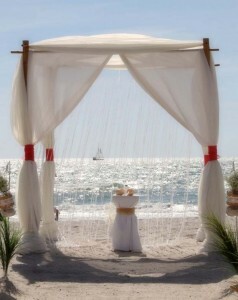 Going the extra wedding mile - a crystal drape and a chandelier. Help! My dream wedding doesn't fit a package! 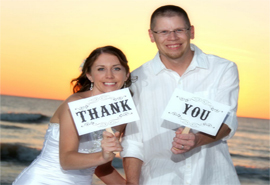 Suncoast Weddings have been in the romance business for more than 18 years and we specialize in assisting couples from all over the world live out their wedding dreams here in Florida. 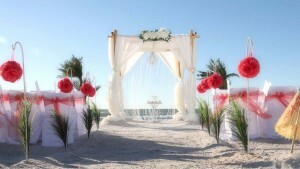 Our beach wedding packages have been designed to help take all the guesswork out of planning your destination wedding. 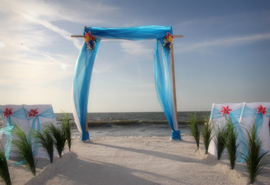 So if you’re thinking of a beautiful romantic Florida beach wedding, a proposal or a vow renewal – no matter how simple, unique or lavish the requirements - we know we can make it happen. 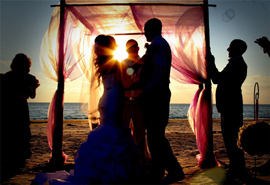 Planning a wedding, especially a destination wedding, can be exciting yet very daunting and intimidating at the same time, which is why you need to have a level of comfort and trust in the company you choose. 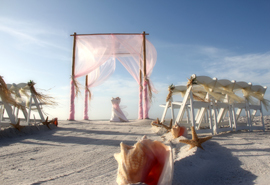 We don’t claim to be the experts in everything, but we do claim to be the experts in what we do best – simply beautiful weddings by the Gulf of Mexico. We want your big day to be perfect just as much as you do, so that you can relax and enjoy the moment when it finally arrives. 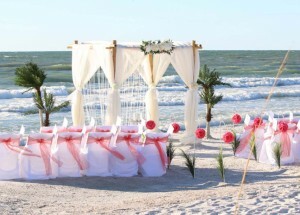 Trust Suncoast Weddings to deliver Florida beach weddings and vow renewals with class, elegance and style - all at the right price. Ready to explore our site?